Well, now we are in the Feast of the Trumpets, and though we are in the dress rehearsal, when the day comes, we will hear Adonai’s Trumpet; sounding the alarms, and we better listen up. With that being said, let’s take a gander at some of those connections before heading over to the Trumpets- Yom Teruah. On Creation Day “5,” Birds and Fish were created. They swim/fly fiercely and rapidly; taking the seed out in the water/wind currents—carrying out HIS Word. There are (7) Spirits of Yahweh (G-d), (7) Days of Creation, (7) Feasts, (7) Churches and (7) Candlesticks (Menorah- 7 branches). • The Spirit of Power ( Ruach Gvurah—Mighty Warrior) alludes to the strength to carry out a task or commandment of Adonai (Creation Gospel). • Birds scatter seeds (Word) as Disciples spread the Gospel to all nations and moving rapidly. • TESHUVAH-RETURN to Him Repentance/ to turn back to Him! • To mend ones way. • The seeds that fell under the tree on the 3rd day will grow and provide a resting counsel for the birds that return from the scatterings and migrations of the 5th day. • The Ruach haKodesh (Holy Spirit)- Set Apart. There are (3) Themes of the “Feasts of Trumpets” which are in the fall months. The call to remembrance -100 blast of the shofar. • Proclaim Adonai as King on the anniversary of Creation! Yes, it’s an anniversary of HIS creation—us! • To announce the 10-days of Awe as a warning that Elohim will enforce HIS decrees. • To remind us that we said we would listen and do all of HIS Commandments at the giving of the Torah on Mt. Sinai. • To remember that if we don’t change our ways, we are responsible for our own destruction. • Cities will tremble, and so will we. • It reminds us that the shofar will be blown on the Day of Judgment. This is a self-check in asking ourselves, “Where are we in our walk? Are we REALLY following HIS WAYS!? Wake-up!! 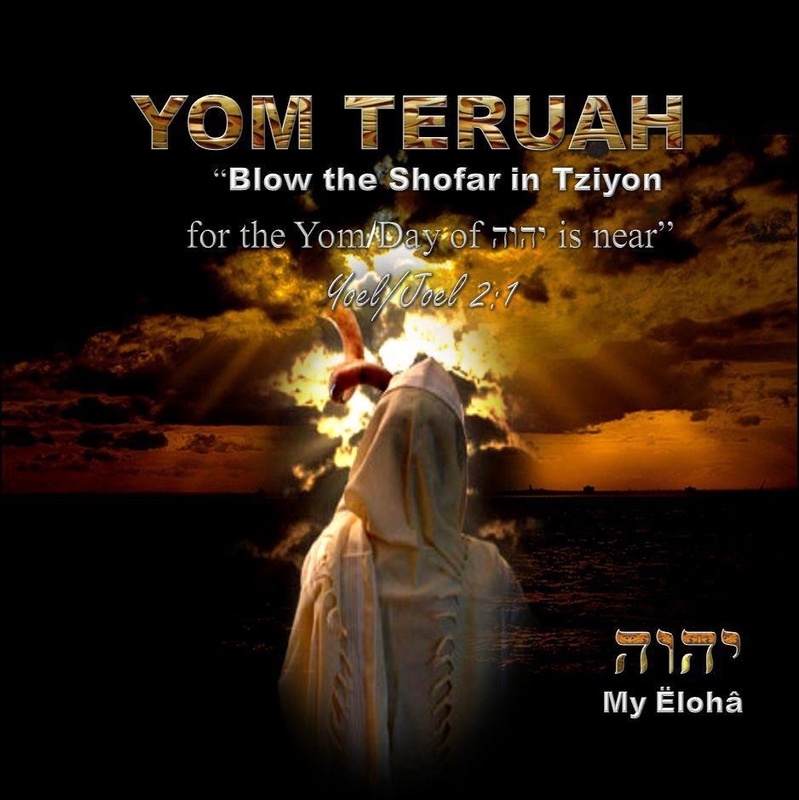 • The shofar will be blown on the day of resurrection. This reminds us of HIS victory over death!! At the blowing of the shofar, HE will come to awaken the dead, enact judgment, and rule as our King (Cathcart). All of these reasons relate to the coming of our Messiah Yeshua. (v) 23 ADONAI said to Moshe, 24 “Tell the people of Isra’el, ‘In the seventh month, the first of the month is to be for you a day of complete rest for remembering, a holy convocation announced with blasts on the shofar. The Feast of Trumpets is also the beginning of the seventh month on the Biblical calendar, which holds a great significance as it is also the Sabbatical month—set apart. The number seven also represent spiritual completeness (Carthcart). 29 “‘In the seventh month, on the first day of the month, you are to have a holy convocation; do not do any kind of ordinary work; it is a day of blowing the shofar for you. and his arrow will flash like lightning. and go out in the whirlwinds of the south. It is a time when Israel remembers their G-d of Abraham, Isaac, and Jacob (Israel), and repents, humbles themselves, and calls out to their Father and HE listens to HIS children and brings them to the Promised Land in their rejoicing. Remembering the promise Elohim made to Abraham, G-d will carefully gather HIS people back to Him on the great blowing of the shofar. And at that, the books are opened to be read who is in the “Book of Life” and “Book of Deeds.” Those who are not in the “Book of Life” are cast into the Lake of Fire. The “Book of Deeds” is not necessarily deeds that we have gone off to do. The deeds are HaShem’s DEEDS on what HE has already told us to do in the Bible. Have we done what HE has already asked us to do that were written in HIS TORAH (G-d’s instructions)? As our Father draws nearer to us, that is when we need to draw nearer to HIM just like Moses did. We should not hide when the Father draws near us like Adam did in the garden. Don’t wait until the trumpet blows…..one breath too short would be a tragedy for Eternity.